Artlandia, Inc., maker of award-winning pattern design software, has released Artlandia SymmetryShop 2, a major new version of its Adobe Photoshop plug-in. SymmetryShop is a companion of Artlandia SymmetryWorks, which provides a similar functionality in Adobe Illustrator. The new version significantly streamlines the workflow for creating sophisticated surface designs and automates the creation of new classes of patterns in Photoshop. As a tool for creating professional-quality pattern designs, SymmetryShop supports all seventeen standard symmetry types as well as built-in layouts that produce the most popular repeats with a single click. These include drop, brick, diamond, gradation, scale, spot, grid, and other repeat types. The plug-in creates both interlocking patterns and patterns based on simple geometric regions, possibly with smoothed away boundaries. Both surface patterns and borders can be generated. SymmetryShop easily exports patterns as Photoshop presets that are available to the paint bucket, pattern stamp, and other tools. Most importantly, SymmetryShop patterns remain fully editable and allow unlimited iterations and refinements in multiple Photoshop sessions. The user can interactively edit the source image in Photoshop and rebuild the pattern with a mouse click, at any time after the pattern has been created. The new version adds support for smart objects and offers powerful new ways to design patterns. 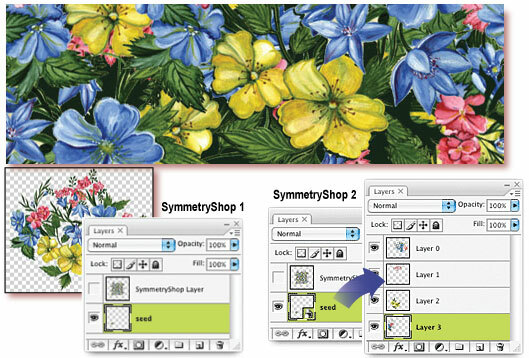 With SymmetryShop 2, smart objects, introduced in Photoshop CS2 and enhanced in Photoshop CS3, allow the designer to make patterns from any combination of source layers, including complex vector art. Users can now also create all-over, tossed, composite, and other repeats, and generally nest SymmetryShop patterns by using one pattern as a source for another, and generate an essentially unlimited variety of other pattern types. Placed as smart objects, all components remain separately editable and the designer is free to replace, non-destructively transform, and otherwise rearrange the elements of the pattern motif--or add linked copies that automatically update as soon as one of them is edited and saved. Once the motif is edited, the plug-in lets the designer rebuild the pattern with a mouse click, simply by playing an action. SymmetryShop 2 also supports text and other vector shapes, fill layers (filled with a solid color, gradient, or pattern), as well as layer and vector masks applied to all types of layers. Masks allow the user to isolate (mask) parts of the seed layer that should not be used in the pattern. The user can edit vectors and masks with the familiar Photoshop tools or edit the text, change the font or formatting, warp, or apply any other Photoshop editing technique. After the edits, the pattern can be similarly updated. The new version also adds numerous productivity enhancements, such autorun, an automatic canvas extension, an automatic selection of non-transparent pixels, the ability to lock (fully or partially) the seed layer, and others. The autorun feature, which is available in Photoshop CS3, allows the designer to edit the seed layer in one window while viewing the updated pattern in another window. Artlandia SymmetryShop 2 for Macintosh and Windows runs on all major operating systems and is available immediately. The plug-in requires Photoshop 7 or later version. Photoshop CS2 is recommended for using smart objects and Photoshop CS3 for autorun. The download-only version of the plug-in costs US$295 or US$449 in a value package with Artlandia SymmetryWorks 4. The upgrade from the previous version of SymmetryShop costs US$75 (download). More information about SymmetryShop 2 is available on the Artlandia web site, http://www.artlandia.com.